Mine: I really wish that I had the chance to see this in a theatre. I think that it would go up at least 1 star if I did. As it is I really like it. Wonderful cast. Great action. tons of fun. 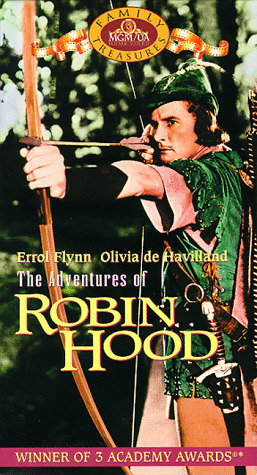 Leonard Maltin/Plot synopsis: Dashing Flynn in the definitive swashbuckler, winning hand of de Havilland (never lovelier as Maid Marian), foiling evil prince Rains, dueling wicked Rathbone. Erich Wolfgang Korngold's outstanding score earned an Oscar, as did the art direction and editing. Scripted by Norman Reilly Raine and Seton I. Miller. Arguably Flynn's greatest role.